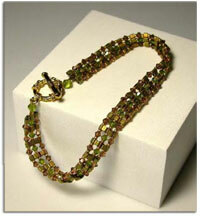 Ladder stitch triangle beads into spacer bars and add crystals and seed beads to create this dazzling bracelet. Ladder stitch triangle spacer bars. Add crystals & seed beads to create this sparkling 7.5 inch beauty.